Nature’s Sunshine ALJ Vegitabs support the respiratory system by promoting natural cleansing processes and soothing irritated tissue. 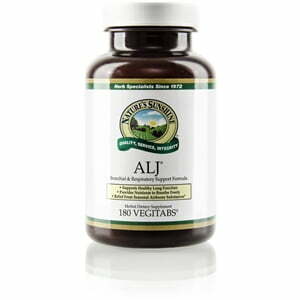 ALJ Vegitabs provide support for both the cleansing of airborne particles and for seasonal changes that cause irritation. Formulated to help fight bronchitis, breathing difficulty, ear aches, sinus discomfort, and coughing, this formula includes magnesium, calcium, phosphorus, manganese, potassium, silicon, and selenium. Instructions: Take two to four tablets with a meal three times daily. Cellulose (plant fiber), sorbitol, stearic acid (vegetable), maltodextrin, silicon dioxide (powdered silica), guar gum (Cyamopsis tetragonolobus), gelatin, water, and glycerin.